Playground Fragment, 2015. Sculpture – Lacquered Steel. 205 x 78 x 91cm (80.71 x 30.71 x 35.83in). 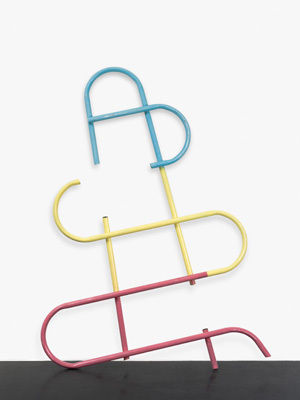 Przemek Pyszczek’s painted metal sculptures are open, expansive and candy-coloured. Yet they represent urban dead-ends. Pyszczek, a Polish-Canadian sculptor living in Berlin, replicates graphic decorations on Plattenbauen pre-fab architecture and jungle-gyms dotting housing projects in Poland. For his 2014 series Facades, he trapped paintings of cheerful coloured forms behind curved security bars. In his current Playground Structure series, currently on view at Berlin’s Peres Projects gallery alongside Donna Huanca’s paintings, networks of metal pipes invite escapist to play but promise danger. Here Pyszczek discusses the socio-political and personal context for his compellingly contradictory sculptures. AFH: What is your physical response to your work? Do you react to the joyful colors and childhood associations with wanting to climb and interact with them? Or do the surreal angles you create repel you? Playground Structure (Tunnel), 2015. Sculpture – Lacquered Steel. 270 x 160 x 250 cm (106.3 x 62.99 x 98.43 in). Courtesy Peres Projects. PP: These works are about tension, and in my recomposition, I am looking to unsettle the forms which both removes and adds tension. The work reflects other tensions, such as the tension I have felt with my migrant background – not feeling Polish or Canadian, not even understanding what that feeling is when people ask, and the tension that exists in an individual as they negotiate their sense of self and their role within a broader social context. AFH: How does the Plattenbauen architecture that inspires your sculptures differ from social housing elsewhere? Is your work specifically focused on Polish urban aesthetics or can it apply to global urban housing issues? PP: From a general aesthetic standpoint, these buildings are similar to other prefabricated concrete panel buildings in other parts of the world, and specifically formerly communist European countries. That said, unlike in other parts of the world where these buildings may have been built in limited numbers, or as standalone projects, in Poland and the other then-communist states, it was a matter of national policy to build these types of buildings after the war. In Poland this was even more pronounced as there was much more wartime devestation, and an efficient, cost-effective way of constructing mass housing had to be developed. Today over 25% of Poles live in this type of construction. The buildings may seem similar, but each country had a variety of its own standardized systems. Poland had more than ten different systems, each one looking and functioning differently than the other, and having different permutations and possibilities in construction. Playground Structure (Tower), 2015. Sculpture – Lacquered Steel. 224 x 168 x 0 cm (88.19 x 66.14 in). Courtesy Peres Projects. I’m interested in Polish urban aesthetics and their social ramifications not only because it is something of a personal interest in my history, but in the exploration and research I’m undertaking, I’m navigating a terrain of displacement and tension that I think is relateable to many people, especially in this world we are living in where borders are less firm and people are in a constant state of migration and flux. AFH: How does your family respond to your work? PP: My father and his brother both built these types of prefabricated buildings in Poland back in the seventies and eighties, so they have provided invaluable insight and anecdotes about the construction of these buildings – how quickly things could be built, the process in which things were constructed, technical problems that would occur, the way in which people would customize their standardized units. Today my uncle and one of his sons are building contractors, and they along with craftspeople they work with have helped me with my with my work, which is very exciting because this process provides a connection to a time and place that I am seeking to better understand. AFH: Growing up with a diaspora identity, did you have a romantic attachment to Plattenbauen architecture? 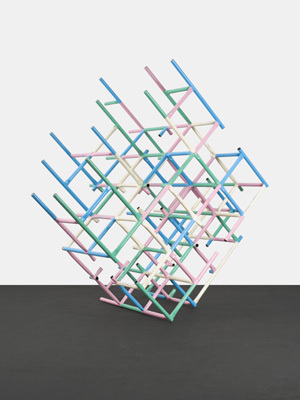 Playground Structure (Grid), 2015. 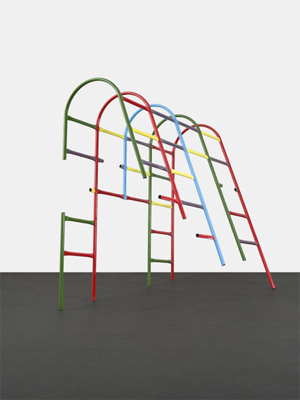 Sculpture – Lacquered Steel. 310 x 177 x 274 cm (122.05 x 69.69 x 108.27 in). Courtesy Peres Projects. PP: My family moved to Canada when I was quite young, and didn’t return to visit until I was fifteen years old. My next visit after that, I had just graduated from university, where I studied architecture. These vists are where I gained a better understanding of what was happening in Poland in terms of architecture and urbanism. Growing up, I knew that my father had built apartment buildings at one point in Poland, and that we had lived in one, and so did almost everyone else in our family, but it wasn’t until visiting Poland on my own as an adult and having an architectural background and conducting research that I realized the magnitude of the social program that had created the landscape that exists today. AFH: Tell me about the different locations and settings where your work has been shown and how those environments effect its resonance and meaning for you and other viewers. PP: My work has been been shown in a variety of contexts: white cubes, apartment project spaces, the lobby of a communist-era cinema in Berlin. Each space has its own baggage, both architecturally and conceptually. In a whited out gallery, the viewer is presented with the work on a blank page – the aim is to dexcontextualize the work from an environment that has maybe has visual distractions or signifiers. Whereas when I was part of a group exhibition at Kino International in Berlin, the space had a very loaded history, had a variety of textures and surfaces that were in tension with the work, but I appreciated that the space provided an architectural context that related to my work.